What is a denture? What types of dentures are there? The loss of teeth can occur due to a wide range of reasons. Such reasons are caries, neglected hygiene or any type of ordinary accidents. Luckily, nowadays there is a solution even for this problem. The most optimal solution for this issue is the application of dentures. With the help of a denture, problematic or missing teeth can be easily replaced. It is important to know that there are several types of dentures. For example there are the so-called telescopic dentures, which function as a combination of non-removable and removable dentures. 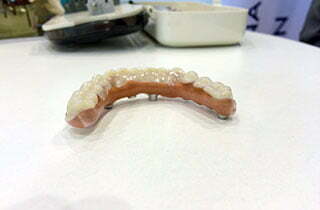 We must also differentiate between complete dentures and partial dentures, based on the needs of the patient. If the patient has some teeth left, the right solution is a partial denture. Of course, if there are no remaining teeth at all, the patient needs a complete denture. Indeed, there are large differences between upper and lower jaw dentures. Since the upper jaw denture covers the whole palate, it obtains a better halt. A telescopic denture represents a combination of both non-removable and removable dentures, since it includes both types in its structure. Telescopic dentures consist of removable denture and non-removable crowns, so called telescopic crowns. These telescopic crowns are divided into two groups, the inner and outer crowns. As the denture is inserted, the inner and outer crowns slip into each other. The friction between inner and outer crowns ensures a secure halt. As there are different types of dentures, there are different materials used for them. Complete dentures consist of two main materials: a pink synthetic material and matching artificial teeth, or rarely even ceramic teeth. Partial dentures are fixed on a metal framework; the teeth consist of metal ceramics as well. The type of a denture and the material make up the price of a denture. 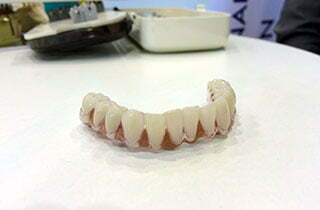 Full dentures on a metal plate are available from 335 £ per jaw. It is important to note that if they are supported by implants, the costs increase. Meanwhile, partial dentures that are anchored to existing teeth, cost from 418 £. Before even considering the insertion of a dental implant, the state of health of the patient has to be revised as well as possible risks need to be taken into consideration. For the dental implant titanium is used, since it is more compatible with the human body than any other material. Usually, the anchoring of the teeth is ensured by the patient’s own dental roots. However, with the loss of teeth this function is ensured by the implants. The dentist performs implant surgery with local anesthesia. Different types of dentures will then be anchored to the dental implants in different ways. When it comes to the usage of dentures, one has to be careful, since removable dentures especially can easily be damaged. In such cases, either the repair of the denture is required or in rather difficult cases the prosthesis needs to be completely replaced. Dentures can be life-changing for people. Are you having problems with chewing and biting? You don’t even dare to smile anymore? Do you have gaps you are ashamed of? All these issues can be solved by the application of a denture. Of course, it needs to be determined which type of denture is the most appropriate for you, so that it fits your needs.